Do you think an adjustable Driver or Fairway Wood is, or would be, good for your golf game? Do you think the benefits justify the cost that comes with adjustability in the technology? So many of the manufacturers now have adjustable Drivers and Fairway Woods that it must be both an indication that they think the technology has real benefits, and that so many golfers are now prepared to invest in an adjustable Driver or Fairway Wood. The initial motivation behind this technology was, I think, shot shape and the ability to remove a slice or create a draw. For many golfers the challenge of finding the fairway, and not the rough or trees, wide on the right (for right-handers), was spoiling the fun on too many holes. Getting an adjustable Driver offered some hope of removing the challenge and having more fun. There’s no question that changing the CoG (with adjustable weights) and face angle will reduce the impact of your poorer shot shapes and even create the desired shot shape. 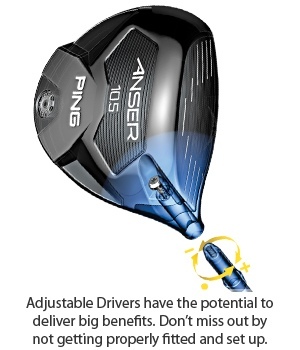 So adjustable Drivers, set up properly, will add accuracy and get you playing from the fairway more often. But the most common problems I find with the setup on Drivers are: wrong shaft strength and wrong loft. The former can have a huge impact on accuracy. When assessing golfers’ swings I also find two common issues that can be easily improved: wrong position at the top and starting the downswing with the wrong sequence of body movements. In both cases I find golfers “outside the line” on the downswing, creating a slice or pull shot. Whether you are looking at adjustable Drivers or non-adjustable Drivers, the process is the same. Let’s assess where your swing and current equipment are and then make a decision together on the right approach to deliver the results you want as quickly as possible. If it’s an adjustable Driver, you still need to be fitted to get the best results. So contact us; don’t buy and hope. This entry was posted in golf and tagged fitness, golf, golf lessons, golf tips, LPGA, PGA. Bookmark the permalink.